Graham's show opens at 5:30pm on the 20th of May at the Satellite Gallery http://www.satellitegallery.co.nz/, and runs through the 1st of June. 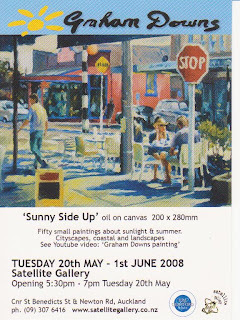 He is showing 50 small pleine air paintings of the Auckland area. We will definitely be at the opening! We feel like we've lived this one with you, Graham!